Weather, and the Destruction of Civilizations, Eugene Linden connects climate change with the rise and fall of civilizations. Linden cites scientists who say that climate does not shift from consistently warm to consistently cold but flickers rapidly between warm and cold and wet and dry over several decades. "Rapid shifts between warm and cold throw ecosystems out of balance, unleashing pests and microbes, and ruining crops," says Linden. Just a few of the fascinating scenarios he presents, linking climatic shifts with cultural development, are presented below. The generally upward temperature trend since the end of the Pleistocene has been punctuated by periods of more rapid warming and of rapid cooling. The most severe cooling was a freshwater influx into the North Atlantic around 8,200 years ago that caused a plunge in temperatures of 9°F (5°C). This event was similar to the Younger Dryas but lasted between 60 and 200 years. This cooling event interrupted the emergence of civilization in Turkey, where agriculture and cities had been developing. The return of cold, dry, and windy weather necessitated that people devote their energy not to innovation but to survival. 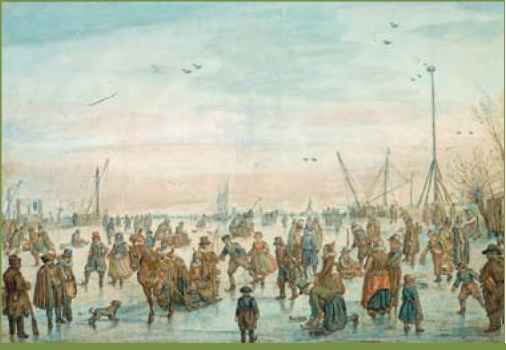 Ice core data show that the period from 8,000 to 5,200 years ago was relatively warm, allowing the development of irrigated agriculture and permanent settlements. An abrupt cooling that occurred about 5,200 years ago again derailed cultural advances. Conditions were very cold and very wet, although this period seems to correspond with the beginning of cities in Mesopotamia and the Nile Valley and with the start of calendars. Scientists have uncovered the temperatures over the Greenland ice sheet for the past 18,000 years. This plot shows the very large plunge into the Younger Dryas, the much smaller dip at 8,200 years, and the relatively tiny ups and downs of the Medieval Warm Period and Little Ice Age. The most recent temperatures do not show up on the graph. the Byrd Polar Research Center of Ohio State University. Global patterns of droughts and flooding from that time period suggest that the climate was dominated by an extremely strong El Niño that lasted for more than two centuries. Climate sometimes wreaks destruction on humans (or organisms) by creating the conditions that promote the spread of disease. The Justinian Plague, which occurred in A.D. 541 to 542, was the first pandemic, an outbreak of infectious disease that spreads over a large region of the world. This plague may have originated in a rapid freeze that came in A.D. 536. No one knows what caused temperatures to plummet, but the rapid change indicates that the event was catastrophic, such as an asteroid impact. The cold snap brought on a cycle of floods and drought, which increased the food supply for East African rodents and caused their populations to increase faster than their predators' populations. The rodents harbored fleas (Xenopsylla cheopis) that contained the bubonic plague bacterium Yersinia pestis. The rodents are not susceptible to the disease, but the plague bacteria block the fleas' digestive tracts. The fleas bite everything to try to slake their hunger, spreading the infection as they go. The plague bacteria migrated northward on fleas that eventually infected Rattus rattus, the black rat, which has lived in close proximity with humans for millennia. The Justinian Plague laid waste to Constantinople, Alex--andria, and other major world cities, killing millions of people during the following two centuries. Lonnie Thompson's life began far from the tropical mountain peaks where he now spends much of his time. As a boy on a farm in rural West Virginia, he was fascinated with meteorology. He attended Marshall College, where he studied to become a coal geologist. Thompson married the only woman studying physics at Marshall, Ellen Mosely, and the couple moved to Ohio State University for graduate school. Thompson's life took a fateful turn when he secured a research job working with the first ice cores ever collected. The young geologist was entranced by the immense possibilities that ice cores held for the reconstruction of past climate and was inspired to switch his studies to glaci-ology. After one field season in Antarctica, Thompson decided to study tropical mountain glaciers, ignoring the prevailing idea that mountain glaciers were too active to contain a usable climate history. In 1974, he became the first scientist to drill a mountain glacier, the Quelccaya ice cap, at an elevation of 18,600 feet (5,670 m) in the Peruvian Andes, and he has worked on mountain glaciers ever since. 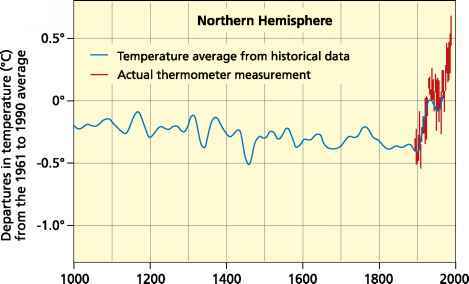 The Medieval Warm Period (MWP) lasted from about A.D. 900 to 1300. Although its cause is not yet well understood, it seems to be related to a strengthening of Atlantic meridional overturning. The MWP was a time of relatively warm, dry temperatures (although it is worth noting that temperatures during the MWP were never as high as during the 1990s). In Europe, crops thrived, and the people were reach the research center, they are stored in refrigerated vaults that are maintained at Arctic temperatures of -22°F (-30°C). Thompson braves these adverse conditions because of the important story that tropical mountain glaciers have to tell about regional climate and environmental change. Tropical glaciers contain a thorough record of El Niño events and, he says, understanding the natural variability of these natural climate events is essential for assessing the degree to which human activities are now inducing climate change. Tropical regions are also extremely sensitive to greenhouse gas levels: If rising CO2 causes tropical oceans to evaporate, the added water vapor will raise atmospheric greenhouse gas levels even higher and increase global temperatures. 23,000 feet (7,000 m) of ice reaching as far back in time as 750,000 years. The scientist is now in a race against time to gather as many ice cores as he can before the ice record melts away. He estimates that the Peruvian Andes, which contain the world's largest concentration of tropical glaciers, have lost about 20% of their mass since 1972. For example, in the years 1991-2005, Qori Kalis glacier retreated about 10 times faster (200 feet [61 m] per year) than during the years from 1963 to 1978 (20 feet [6.1 m] per year). As Thompson stated in Ohio State Research in 2006, "What this [research] is really telling us is that our climate system is sensitive, it can change abruptly due to either natural or to human forces. If what happened 5,000 years ago were to happen today, it would have far-reaching social and economic implications for the entire planet. The take-home message is that global climate can change abruptly, and with 6.5 billion people inhabiting the planet, that's serious." healthy and prosperous. Europe's population quadrupled, and life expectancy increased to about 48 years of age. These favorable conditions allowed people to focus on art and religion, erecting extraordi--nary cathedrals and castles. Temperature for the past 1,000 years from tree rings, ice cores, historical records, and thermometers shows a large rise in recent years. 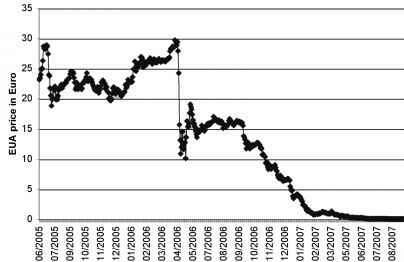 At no time in this graph does temperature rise above the 1961 to 1990 average (shown as the zero line) until the past few decades. The Medieval Warm Period (900-1300) shows much lower average temperatures than seen in the recent warming trend. the Maya had built a remarkable civilization. 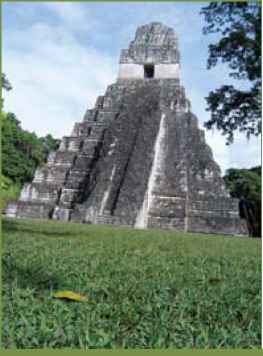 They had constructed glorious pyramids, such as those located at Chichen Itza and Tikal. The Maya were advanced in astron--omy, the calendar, and in a skill that was extremely important for their drought-prone location: water management. Mayan farmers depended on annual rains from late spring to early fall for maize production, and on their rulers for drinking and household water during the annual dry season. Water was the means by which the Mayan elite maintained their rule because only they had the resources to store water in reservoirs and maintain its quality. Despite its accomplishments, the Mayan civilization collapsed around A.D. 900. Many hypotheses have been offered, but new seafloor sediment analyses and tree ring data point to extreme drought as the primary cause. Because reservoirs could store water only for a year or two, when Mayan rulers were no longer able to supply their subjects with water, the civilization failed. Farmers moved to other areas or, more likely, died of starvation and thirst. People weakened by famine are also more prone to disease. different times in different locations: It struck Greenland in 1343. Archaeological evidence shows that at least one household slowly starved over the years until the inhabitants finally died out in 1355, the worst winter in 500 years. led to failed crops. Famine killed millions of people and triggered social conflict and war. The LIA struck Great Britain earlier than Greenland. The River Thames, which flows through London, froze in 1309, but then the weather warmed up and brought in large storms. Crops rotted or failed to ripen, and livestock froze. Beginning in 1332, the cycle of floods and drought in Mongolia and China brought about the bubonic plague. After killing 35 million people in China, the Black Death spread to Europe, where it killed between one--quarter and one--half of the population: 20 to 50 million people who were already weakened by famine and other diseases. Bubonic plague came and went over the next few centuries. Still, the LIA was not a time of constant cold: Between 1400 and 1550, the climate became more moderate. This mild period corre--lates with the Renaissance, a time of great technological and artistic advances. Then, from 1550 to 1850, winters again turned long and severe, and summers were short and wet. In the seventeenth century, in Switzerland, glaciers advanced down mountain valleys and crushed villages. In North America, in the winter of 1780, New York Harbor froze solid, allowing people to walk from Manhattan to Staten Island. Superimposed on the LIA was the Maunder Minimum, a period with extremely low sunspot activity. This period corresponds with the deepest cold of the LIA, from 1645 to 1715.